The YarraBend development is an architecturally striking addition to Melbourne’s north-east. Projected to be the world’s most liveable suburb by 2025, YarraBend is a premier, mixed-use site with world-class amenities. Developer Glenvill is enlisting a number of future-thinking architects including DKO Architecture, Techné and Rothelowman in order to construct a high-tech, master-planned community featuring modern residential apartments, townhouses, and house and land packages. Occupying 14.5 hectares, YarraBend is made up of five precincts with 21 parks within a 1km radius. Each residence is carefully crafted to serve as a modern retreat, surrounded by amenities purpose-built to encourage valuable interaction between neighbours and the environment. The Hub, designed by Techné, is a resident-exclusive recreation building where form meets function. Natural accents and raw, exposed concrete combine to create a modern facade and inspiring interiors. The ground floor features welcoming spaces with chef-inspired kitchens and bookable dining areas while upstairs an open-plan coworking space is split into designated workstations. High-tech gadgetry and a private meeting room is provided for freelancers, small business owners and professionals working away from the office or home. Residents can take a break in The Hub’s communal lounge or head up to the top level which includes a cinema, and a rooftop terrace with sweeping panoramic views. Inviting and warm, these spaces are perfect for a movie with friends or time-out with a favourite novel. Glenvill has formed YarraBend on the mantra: build well to live well. The Health and Wellness Centre showcases futuristic technology to assist residents in maintaining a healthy lifestyle. 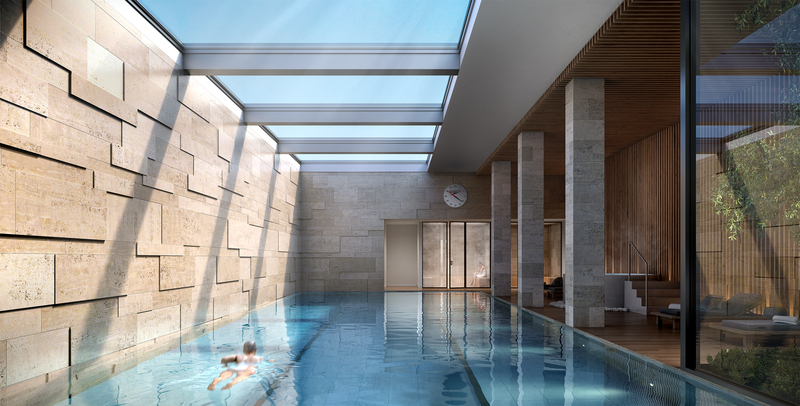 The state-of-the-art gym facilities include premium personal trainers, a yoga room, and a steam room. SmartSpot mirrors provide real-time corrections while data-capture via the Technogym app can track and optimise the user’s evolving workouts. YarraBend residences exist in a suburb with high-speed internet access. The focus on technology continues with the YarraBend app — exclusive to YarraBend residents, it provides streamlined information on public transport timetables and which equipment is free in the gym. Owners can organise car-sharing and even order food from this one application, making life at YarraBend effortlessly integrated. Since the launch date, YarraBend homes have been in high demand, with townhouses in The Mills release selling out in three hours. Read more about the development or enquire here.